Severe skull fractures in newborn children are rare and serious. In severe cases, some infants may develop permanent brain damage, a key cause for numerous debilitating disorders. Did your child suffer severe injuries during labor or delivery? Our experienced personal injury lawyers can help. Learn more in a free consultation today. Our attorneys have the passion and experience to help your family thrive. "Amazing Help." Birth Injury Advocate took great care of me and my family. Birth Injury Advocate Reviewed by Dawn P. on February 17 . Though most of us think of broken bones as an unavoidable rite of adolescence, some newborn babies sustain fractures during labor or delivery. Fortunately, most of these breaks are confined to a child's clavicle, the collarbone, which usually heals quickly without any treatment. Skull fractures are rare, but can be far more serious, since the force necessary to break a child's skull is also likely to inflict brain damage. How common are newborn skull fractures? In some sense, even a routine vaginal delivery is an inherently traumatic process. During childbirth, a baby's body is placed under intense stress. Labor and delivery push the child out through repeated contractions, working against the restrictions posed by the birth canal's natural anatomy. At the same time, most children are delivered head-first. The head, as you may already know, also happens to be the largest part of a child's body. As a result, an infant's skull is subjected to the lion's share of these mechanical forces, compressed and squeezed by the mother's pelvic structure. Thankfully, a newborn baby's skull isn't like the skull you'd find in an adult. If it was, even the most gentle vaginal delivery would be almost unreasonably difficult, if not impossible, for most people. In an infant, the skull hasn't yet cohered into a single, solid bone. At this point in childhood development, the skull is still made up of 5 separate bony surfaces, connected to each other by layers of fibrous soft tissues. These seams, which knit the infant skull together, are known as "sutures." As we age, the sutures close up, eventually creating the rigid surface of bone that we normally think of as a skull. During early childhood, however, the flexibility of an infant's skull sutures becomes critical. As the brain develops, it grows larger. To make room for a rapidly-growing brain, the skull needs some way of expanding. Sutures are the answer to this problem. Because the sutures are still flexible, the bones of the skull are allowed to move around inside the head, providing ample space for the brain's development. Once the brain is done growing, the sutures can close up and solidify, creating a continuous and rigid layer of protection for the brain. Skull sutures also turn out to be essential during labor and delivery. A baby's head doesn't fit through the birth canal easily. In reality, the skull has to be squeezed to make its way through a very narrow passageway. And those flexible skull sutures make this possible, allowing the child's head to "mold" (quite literally) in response to the pressures exerted by delivery. The bony plates of the skull move, shifting in position, and, in many cases, even coming to overlap at times. This explains why so many children are born with elongated ("cone-shaped") heads. Paradoxically, an abnormally-shaped head is absolutely normal after birth. In the absence of other factors, an uneven, or "cone-shaped," head isn't always a sign of skull fracture. You'll usually hear the term "fontanelle" used to describe the two soft areas on a newborn's head, one in front and one in back. These squishy areas are where two or more sutures come together, creating large gaps between the skull's bony plates. In some sources, you'll see the word "fontanelle" used as a synonym for "suture," but that definition is actually incorrect. Most parents notice that their baby's head is unusually soft. We've just found out why - because your child's skull hasn't fused together yet; the bony plates of the skull aren't completely "ossified." These characteristics are essential evolutionary solutions to the problem of delivery, but they also make the infant skull vulnerable to injury. Researchers have long believed that infant skull fractures are very rare, at least for children born in spontaneous vaginal deliveries. That perspective is disputable, however. Some doctors today believe that the rate of skull fractures among newborn infants may be underestimated to a great extent. According to physicians at South Korea's Ajou University, a significant proportion of infants could be sustaining incomplete, or greenstick, skull fractures that go undiagnosed. As we just mentioned, a baby's skull hasn't "ossified" completely; it isn't yet a rigid and continuous bone. That makes diagnosing skull fractures very difficult, especially when a physician is only using an X-ray to examine the extent and severity of a child's birth trauma. With those soft, flexible bones and numerous skull sutures, many infants could be suffering incomplete fractures, without physicians noticing it. 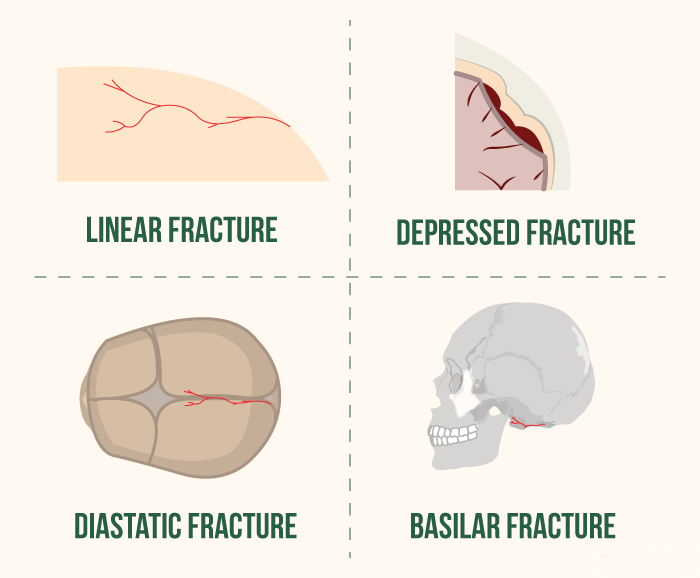 Diastatic fractures occur across the line of a skull suture, pushing the bony plates apart. Most diastatic fractures occur in newborn children, since the adult skull (in most, but not all, cases) have fused together completely. In infants, undiagnosed diastatic fractures can quickly turn into "growing" fractures, in which the break continues to expand after the initial traumatic event. Growing fractures can be very serious. As the suture continues to separate, underlying brain membranes can tear, too. In severe cases, a growing skull fracture can result in herniation, when parts of brain tissue and other internal membranes start to bulge through the opening. Depressed (or "ping-pong") fractures happen when the skull is forced downward toward the brain, like an indentation. Depressed skull fractures can be very severe, since broken bits of bone can apply pressure to the brain, ultimately leading to brain damage. Many infants will require surgical intervention. Linear fractures occur when the bone splits into two separate pieces, but neither portion moves out of position. Linear fractures usually heal on their own with adequate medical supervision. Basilar fractures are defined by their location, not their nature. Any break in a bone below the neurocranium (the part of your skull that holds the brain) falls under this category, including fractures in the eye sockets, nose bones, ear bones or in the occipital bone, which forms the base of the skull, directly above the neck. That last form of break, a basilar fracture, implies an important point that we should highlight: your skull isn't just the bony thing on the top of your head. That's just one part of the skull; it's called the neurocranium, because it covers and protects your brain. The viscerocranium, which forms the lower face and jaws, is still very much a part of the skull. Greenstick fractures are incomplete. Instead of breaking into pieces, the bone bends and cracks, but this crack doesn't run all the way through the bone. Greenstick fractures aren't common in adults, since the bones of an adult are hard and rigid. As a result, greenstick breaks are normally seen in pediatric patients, because the bones of an infant are soft and flexible. Complete fractures occur when the bone is snapped into two distinct pieces. In addition to greenstick and complete fractures, we can also define comminuted fractures, when the bone breaks into three or more pieces. Skull fractures are most common during difficult deliveries, especially after a protracted (or very long) labor. Long deliveries increase the risk for a skull fracture because the infant's head is put under extreme stress and forceful contractions for extended periods of time. In addition, many obstetricians choose to intervene during long and difficult deliveries, often through the use of a birth-assistive instrument. In extreme cases, the mechanical forces entailed by delivery can be enough to break a child's skull. Combined with the use of forceps or vacuum extractor, the risk only increases. Another major risk factor is known as "cephalopelvic disproportion." In these cases, there's a mismatch between the size of a child's head and the size and shape of the mother's pelvis. When birth complications pose an unreasonable risk of harm, an emergency c-section may be indicated. The signs of a skull fracture will differ based on the injury's severity and location. Some babies go home with their parents and seem fine for months, until the development of seizures or a missed developmental milestone clues their family in to a potential problem. Where minor fractures are concerned, a child can look fine on the surface. In fact, they may seem fine in every way, even though a fractured bone lies below the skin. Babies who suffer head trauma are "frequently asymptomatic," doctors at Harvard Medical School report. In short, they don't show any symptoms of being injured. Severe fractures, on the other hand, may be evident upon physical examination. In some cases, physicians will be able to diagnose a broken skull bone simply by palpating (or feeling) a child's head. Likewise, physical deformities can be visible from the outset. Some children will have raised bumps, swelling or bruising that may or may not indicate the presence of a fracture. Most doctors, though, will rely on diagnostic tests, like an X-ray or CT scan, to see inside a child's head and identify signs of injury. Further testing of this sort can be used to examine the existence and extent of brain damage that may have been caused by the fracture, along with the effect an injury may have had on blood vessels in the brain. As an ongoing monitoring process, doctors usually take routine measurements of a child's head to track buildups of fluid inside the skull. In babies, a common response to the early stages of brain damage is the development of low muscle tone, a loss of tension in muscle groups. Young children may appear "floppy," like rag dolls unable to use their limbs with any precision. The most significant risk posed by a skull fracture is brain damage. Broken bones can lead to intracranial bleeding, which puts undue pressure on a child's brain. In some cases, the brain is actually pierced by a shard of bone, or pressed down upon by a portion of bone that has become deformed through brute impact. No matter the precise mechanism of injury, traumatic injuries to the brain can lead to long-term neurological damage, including permanent disorders like cerebral palsy. Children with severe head injuries early in life can suffer from seizures and may live at an increased risk of developing life-threatening infections, including the brain infection known as meningitis. Isolated damage to specific brain structures can lead to permanent focal neurologic deficits, in which the impaired nervous system function causes disabilities in related organs or muscle systems. Paralysis in a single arm and Horner syndrome, in which the eyelid on one side of a child's face droops, are relatively-common examples. Minor injuries, particularly fractures of the linear type, don't usually require medical intervention. While children should be observed carefully for signs of trouble, simple, small fractures tend to heal on their own.